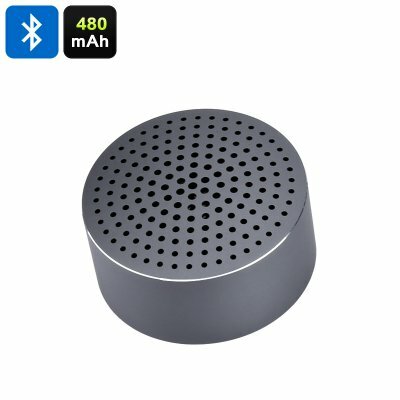 Successfully Added Xiaomi Mi Mini Bluetooth Speaker - Bluetooth 4.0, Noise Reduction, Hands Free, 480mAh Battery, Tough Aluminum Alloy to your Shopping Cart. The Xiaomi Mi Mini Bluetooth speaker with subwoofer is a low on price but big on sound. This mini speaker can easily sit in the palm of your hand and at just over 60 grams and measures about 5CM in diameter and only 2.5cm high it easily slips into any pocket, bag or purse. Beautifully crafted with an aluminum alloy body the Xiaomi Bluetooth speaker is tough and durable. This Bluetooth 4.0 speaker is compatible with most smartphones including all the top brands such as iPhone and Samsung and the connection range allows the speaker to be located up to 5 meters away. With its noise reduction system and built-in microphone you can enjoy hands-free calls when paired with your Smartphone. A built-in 480mAh lithium battery brings around 4 hours of usage time and can be recharged in as little as 2 hours. The Xiaomi Mi Mini Bluetooth speaker comes with 12 months warranty, brought to you by the leader in electronic devices as well as wholesale Bluetooth speakers and smartphone accessories..
Arabic: - السماعة بلوتوث - Chinese Simplified: - 蓝牙音箱 - Czech: - Bluetooth reproduktor - Dutch: - Bluetooth luidspreker - French: - Haut-parleur Bluetooth - German: - Bluetooth-Lautsprecher - Hebrew: - רמקול Bluetooth - Hindi: - ब्लूटूथ स्पीकर - Hungarian: - Bluetooth beszélő - Italian: - Altoparlante Bluetooth - Japanese: - Bluetooth スピーカー - Korean: - 블루투스 스피커 - Malay: - Yang di-Pertua Bluetooth - Norwegian Bokmål: - Bluetooth høyttaler - Romanian: - Difuzorul Bluetooth - Russian: - Динамик Bluetooth - Spanish: - Altavoz Bluetooth - Thai: - ลำโพงบลูทูธ - Turkish: - Bluetooth Hoparlör - Vietnamese: - Bluetooth loa.